"You had to be there. It's a cliche worn smooth by time but it is true that often images and other people's accounts of a situation are often a poor substitute for being on the spot. The same holds true for the Idomeni refugee camp that lies on southern side of the Greek - Macedonian border. At night you have the sense that you are on the set of a movie, a mixture of the bridge scene from Apocalypse Now and any number of zombie movies/series in which survivors huddle together for protection. The acrid smell of burning plastic, constant flow of hooded people, and the powerful spotlights just add to the surreal, post-apocalyptic atmosphere of the place. Despite the fact that the border has been closed for over a month the mainly Syrian and Iraqi refugees refuse to leave, and hang on to the hope that Macedonia (along with Serbia, Croatia, Slovenia, Austria and ultimately Germany will reverse their latest decision to close down the Western Balkan Route that allowed refugees to reach northern Europe. They feel they are the victim of some kind of cruel joke that they are stranded in a field in northern Greece whilst so many others, including many of their own family members were allowed to pass just weeks earlier. Another factor keeping refugees in Idomeni is uncertainty over destinations being offered by the Greek authorities, many of which have been hastily erected and offer little material advantage over Idomeni, Why move to another unknown camp when all it offers is a tent in a muddy food and awful food? Refugees already have that. In addition many of these camp are literally in the middle of nowhere, isolated from towns and cities for fear of provoking local residents. As a result there are often a collection of tents in a muddy field with nowhere to go and nothing to do. Plus there is the ever present fear that at any point they may be turned into "closed centres", i.e prison camps where people are held prior to being deported as happened on the Greek islands such as Chios to all those who arrived after 20th March which marked the implementation of the EU's deal with Turkey. 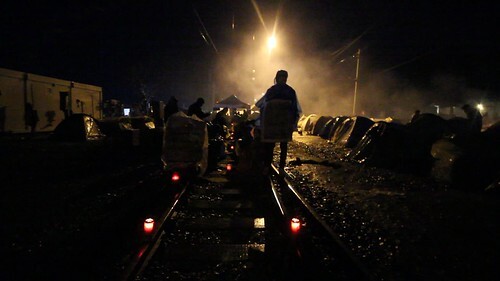 In the video posted here refugees were occupying the railway line which connects Greece and Macedonia in protest over the closed border, however, in the last few days these protests have escalated and yesterday Macedonia border police and troops used tear gas and rubber bullets to prevent refugees crossing the border, According to Doctors Without Borders who are operating at Idomeni over 300 people were treated for the effects of these weapons, including many children who were hit by plastic/rubber bullets or overcome by tear gas which also reached the main camp, far from the border clashes.